Omega, unlike many of the other sponsors, actually has a very important job to fulfill in Sochi outside of contributing funds: Omega takes care of the timing of the individual events. A role so important one could even say it is paramount to the Games’ effective success. Omega has a long history with the Olympic Games and first served as the official timekeeper of the winter games in Garmisch-Partenkirchen, Germany in 1936, where just one single technician utilized 27 mechanical stopwatches for the timing of every event. The current event in Sochi marks Omega’s 26th appearance as official timer of the Games, with the first having been in 1932 at the Los Angeles Games. 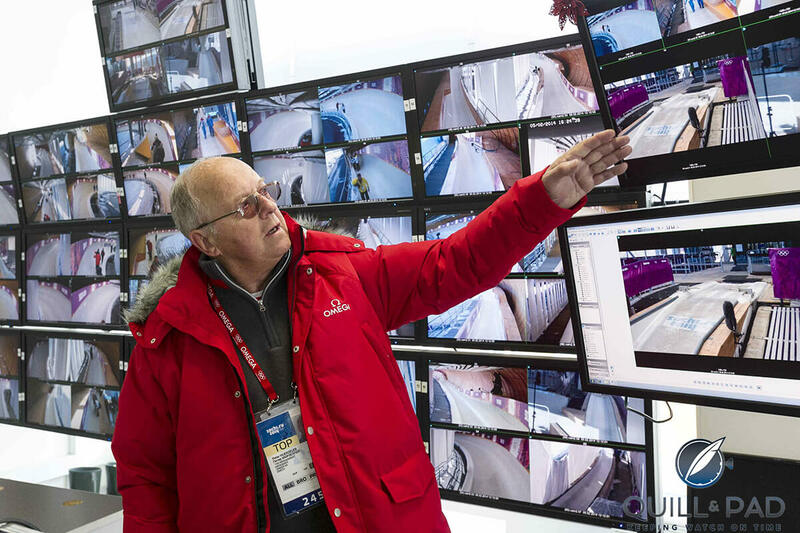 Omega’s presence in Sochi is more than impressive with 260 on-site professionals supported by 170 trained volunteers. They operate 230 tons of equipment that includes 30 public and 90 sports scoreboards connected by 78 kilometers of cable and optical fiber adapted to the requirements of data handling and state-of-the-art timekeeping created for the requirements of each individual sport. Sports event timing for Swatch Group brands is completed with the help of its internal company Swiss Timing, which was created in 1972 as a response to a request made by the Swiss Federation of the Swiss Watch Industry (FH). Longines and Omega, who would become sibling companies under the roof of the Swatch Group in 1988, set up Swiss Timing SA, a company designed to jointly hold timekeeping duties that continued to develop and improve timing systems. Swiss Timing has been present at Olympic Games since 1976, and even now collaborates in Sochi with Omega, whose Omega Electronics sports department was officially integrated into the Swiss Timing structure in 2005. When watching modern sports events on television, it often escapes the viewer just how much effort and history have gone into supplying the little numbers than run across the bottom of the screen. Yet sports timing remained hand-operated until 1945, when photoelectric timekeeping replaced the broken-wire system with a narrow light beam that was crossed by athletes at the start and finish lines, thus communicating the information to chronographs by means of a far more accurate photoelectric cell. This, the harbinger of electronic timekeeping in sports, was first officially used at the Winter Games in St. Moritz, Switzerland in 1948. At the 1956 Winter Games in Cortina d’Ampezzo, Italy, alpine skiing received starting gates that automatically triggered the start time using an acoustic traffic-light signal. In 1968, integrated timing and automatic timekeeping were part of both Longines’ and Omega’s measurements and displays, which were now accurate to one-hundredth of a second. By 1969, the photoprint (Longines: Téléprint) system contained no moving parts whatsoever thanks to microelectronics’ progress. Time was displayed on light-dot matrices and could be filmed by standard cameras or video equipment, thus ushering in the era of televised sports times’ broadcasting. The Calgary Games in 1998 were the first to be computerized, which included timekeeping, results, and even analyses. Since 1999, information generated at any Swiss Timing-timed sports event can be available on the Internet in less than ten seconds. The 2010 Games boasted the new Electronic Start System, which replaced a most enduring image: the starting pistol. In Vancouver, this was supplanted by a streamlined, quasi-futuristic device comprising a flash gun and a sound generation box. When the “trigger” is pushed, three things happen: a sound is played, a light flash is emitted and a start pulse is given to the timing device. By pressing the trigger a second time within two seconds, a false start is audibly indicated. For Olympic sporting results in real time, visit www.omegawatches.com/planet-omega/sport/sochi-2014.